Last year, Pride expanded the offering from commitment ceremonies to weddings, and married six couples at the festival. The same package is available to couples this year. “I’m thrilled we are able to help people be legally married with 300,000 of their closest friends and community members in attendance!” said Dot Belstler, Twin Cities Pride executive director. One-hour slots are available on Saturday and Sunday of Pride weekend. The package includes time to gather guests, get dressed, conduct the ceremony, and take pictures. The ceremony takes place in a white decorated tent, complete with a raised platform, sound system, and chairs for 50 guests, near the formal gardens and lake in Loring Park. A marriage license must be applied for at the Hennepin County Service Center at least five days before the wedding date and brought to the ceremony. 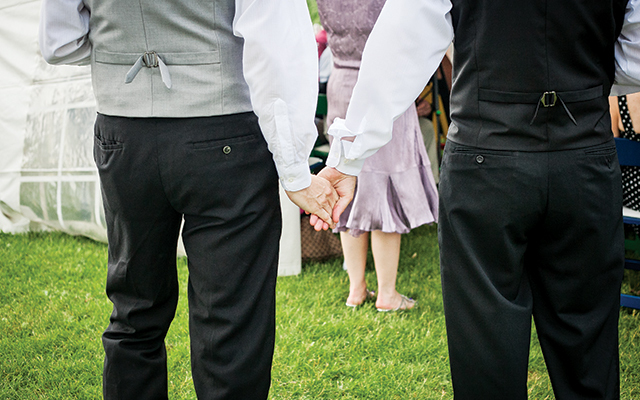 An officiant will be available, but couples are welcome to bring their own! Couples may schedule a rehearsal with the onsite wedding coordinator on the Thursday or Friday before the weekend. Couples wishing to get married at Pride can contact Mary Pokluda at mary@bumblebeepa.com or Dot Belstler at belstler@tcpride.org for more information.